As always ‘The Rats’ try to make a milestone cache something we’ll always remember. Having been beatin’ by the elements the last time we attempted ‘Along the Stony Towers’ it was only natural that we’d have another attempt at it for our 3000th find. I’d assembled a few close friends to accompany me for this potential find. Once again plenty of planning went into assuring we were properly prepared. 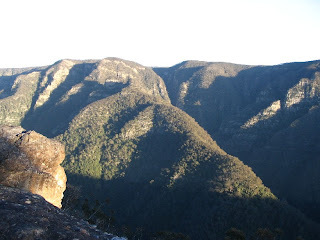 As we set out from the Kanangra Walls carpark it was a welcome relief to have clear skies. After a pleasant walk out along the plateau we headed down to Kanangra Ck, a recent fire had stripped the undergrown, which made our descent somewhat slippery. Soon enough we were crossing the creek and starting the arduous climb up Thurat Spires. The climb up to the 1st spire is almost 500m high and about 1km long, often the ridgeline is less than 2m wide with loose boulders to negotiate. As we neared the top the climb became very steep with some exposed rock climbing/scrambling required. Often we had to scout out a new line as the direct approach wasn’t the best. Eventually and ever so slowly we finally reached the top of the 1st spire. Looking ahead, the route became more exposed and with our safety as a priority we decided to abandon our assault on the 2nd spire. Dejected, we turned and headed for the car, which were still some hours away. Once again I had been foiled in attempt to reach ‘Along the stony towers’. Back at the car there was no time to ponder lost opportunities I still hadn’t found my 3000th cache. One likely idea was to head back to Jenolan Caves to see if we could seek out ‘Wish you were here’. As daylight faded we arrived at the Jenolan caves top carpark. After restocking our packs we headed off for a leisurely stroll up into McKeown’s Valley. While the light faded to complete darkness we were still pleasantly surprised at how beautiful this valley was, it was flat walk in an area that is dotted with steep hills. The wildlife was in abundance and we shared the walk with many a kangaroo, possum and wombats. After a 3km walk we arrived at the remains of the old homestead. Obviously in yester-year this was home of the landowners. Nowadays the wildlife has the run of the area with the chimney the only thing that remains. The cache was quickly found followed by some rejoicing and congratulations from Steeba. I had found my 3000th cache and only the second person in NSW to achieve this milestone. I left my achievement coin in the cache for all future finders. After returning to the car I had time to reflect on the day’s events. I’d walked approx’ 12km round trip to Thurat Spires, I’d walked up and down the equivalent of 2.2km in elevation and then I walked another 6km to finally find my 3000th cache. Its no wonder I slept well that night. Thanks to everyone who has a part of my 3000 cache finds.